The affection that Douglas Jones has for Chevrolet Corvairs can be traced back to his brother’s 1966 convertible. That was the car in which Jones learned how to drive. Years later, in 1988, Jones was working at an Alexandria, Va., Chevrolet dealership when a customer abandoned a car that had been brought in for service work. It was a 1963 Corvair Monza convertible. After paying off the mechanic’s lien the dealership had placed on the car, Jones became to owner of the Corvair. With the kind assistance of some friends in the service department the 145-cubic-inch, flat six-cylinder, air-cooled engine once more was functional. Jones took the 1963 car home and after a bit of cleaning the Ermine White convertible became his daily driver. For eight years the Corvair provided reliable transportation, until the day a brake line failed. Soon thereafter Jones parked his Corvair in his mother’s garage and there the out-of-service car sat until 2006. While the car languished for a decade Jones would visit periodically. “I tinkered with it every once in a while,” he says. The rear-engine Corvair left the factory in 1963 with a pair of single barrel Rochester carburetors. “I couldn’t get them to run right,” Jones says. Eventually he had both carburetors rebuilt. In a typical Corvair, the spare tire is mounted horizontally inside the right rear fender above the engine. The Corvair that Jones owns is one of the few — only 6,641 — Corvairs that was manufactured for the 1963 model year with air conditioning, a rare accessory on a convertible. The condenser and compressor are mounted atop the engine occupying the space where the spare tire usually sits. The spare now rests in the luggage compartment at the front of the car. When new the 2,525-pound Corvair had a base price of $2,481 — less than a dollar a pound. Power from the 102-horsepower engine is transferred to the rear-drive wheels via a two-speed Powerglide automatic transmission. The gear selector protrudes from the dashboard. From the top the gears are labeled: Low, Drive, Neutral, Reverse. The parking brake is used in lieu of a gear for Park. The key to accurate handling and performance is correct tire pressure; 15 pounds per square inch in the front tires while the rear tires should be inflated to 26 psi. The 13-inch tires support the car on a 108-inch wheelbase. On the dashboard just below the 100-mph speedometer is what Jones calls the most critical lighting on his car. The dual warning light on the left measures engine temperature as well as oil pressure. The light on the right indicates generator problems, which often can be traced to a broken drive belt. Consequently, Jones carries spare belts in the luggage compartment — just in case. Around 2007, Jones began a serious effort at restoring his 1963 Corvair to roadworthiness. He found a couple of exterior door skins that took care of the worst cosmetic woes on the car. Jones continued working on his Chevrolet Corvair for two years, until it was prepared to be stripped and painted. He resprayed the car in the original color and since then has slowly replaced, piece by piece, the aqua vinyl upholstery. The front bucket seats are easily upholstered because they have no headrests. Soon after he acquired the Chevrolet, Jones purchased a new convertible top but never found the time or need to install it. Twenty years passed before he pulled the white convertible top out of the box and put it on the car. The plastic rear window is still in place. Jones maintained original parts where it made sense. Certain parts, such as both bumpers, were scarred to the point that they were replaced. 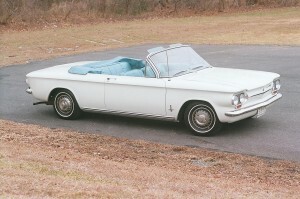 In September 2010, Jones drove his very presentable convertible from Virginia to a national gathering of Corvairs in Massachusetts.